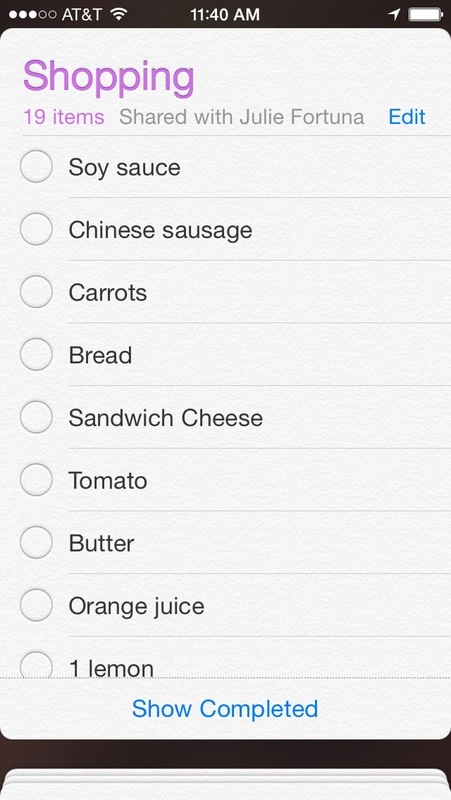 Julie and I usually start our weekly meal planning on Sunday morning over brunch. That way, we can go grocery shopping that afternoon. Brunch is typically eggs (scrambled, omelet, soft boiled, fried, poached, or whatever Julie is in the mood for), toasted leftover whole wheat sandwich bread ends, and fruit. We had guests over on Friday, so we substituted in strawberry long-cake and salad greens. 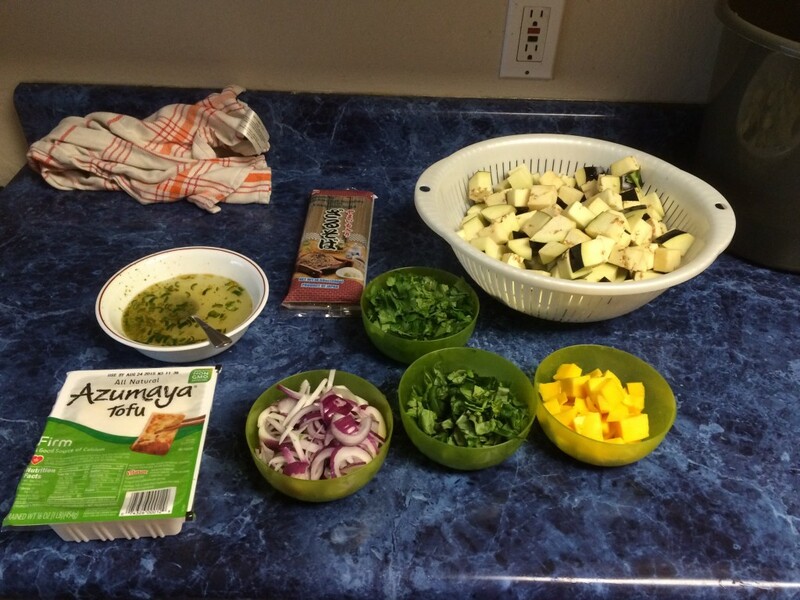 We pick out recipes from a few different sources. We have our favorites and go-to recipes in our head, and more online recipes bookmarked on foodmarks. We try to use our cookbooks, but we (as I imagine most people) have used only a fraction of the recipes on our shelf. 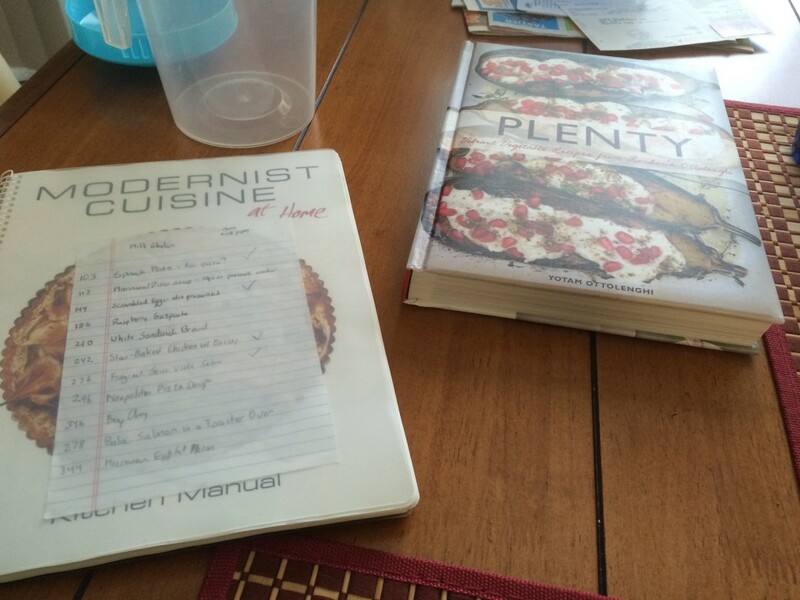 This week, we used two cookbooks we received as gifts: Modernist Cuisine at Home and Plenty. 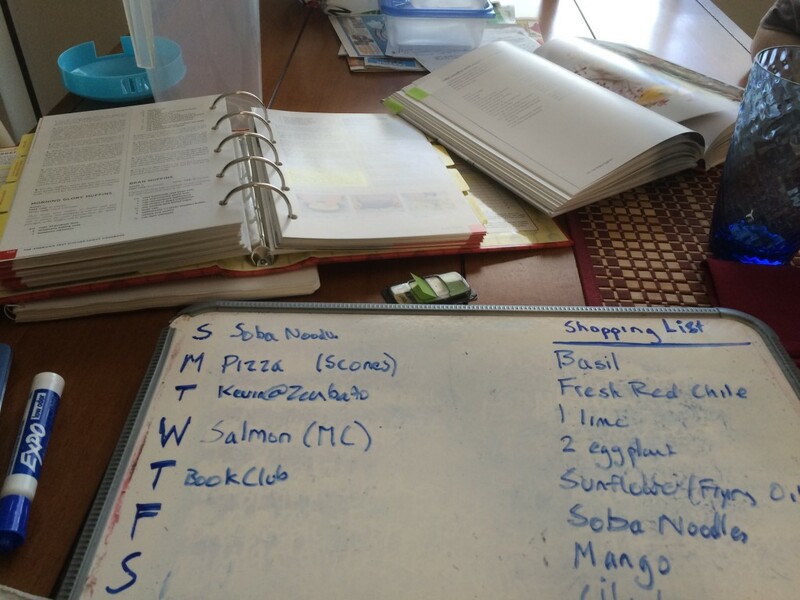 We have a whiteboard on our fridge that we will fill in with dinner plans and our shopping list. We often leave the latter half of the week open as events come up and we have to work through leftovers. 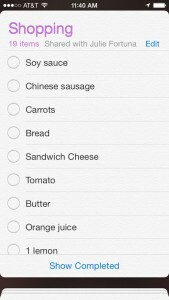 The shopping list is copied over to a shared list on our phones. That afternoon, we headed over to do our grocery shopping. We are lucky to live close to a cluster of 5 grocery stores: Safeway, Sprout, The Milk Pail, Trader Joe’s, and Whole Foods are all within about 2 blocks of each other. 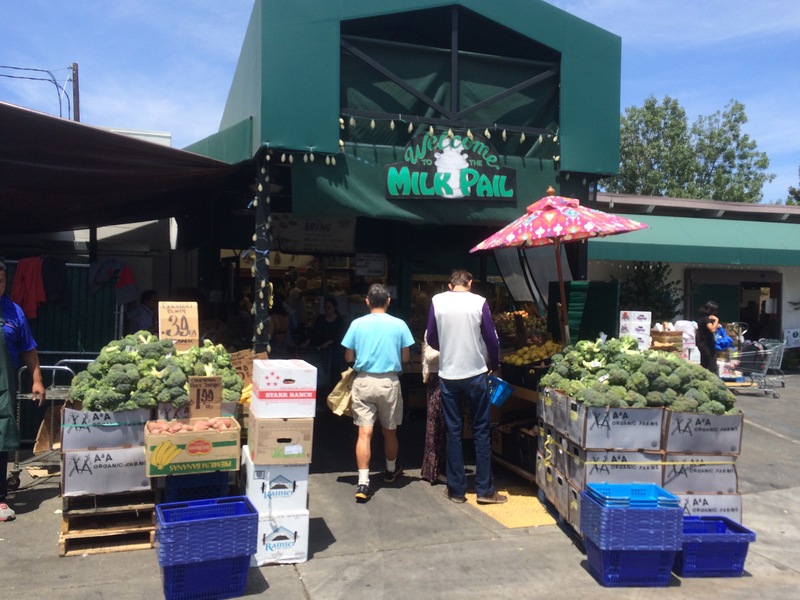 Our first stop is The Milk Pail: it’s an open air European-style market with cheap produce. You do get what you pay for because the quality varies. We often have to pick through a lot of rotting or molding pieces, but it’s worth it for the gems. 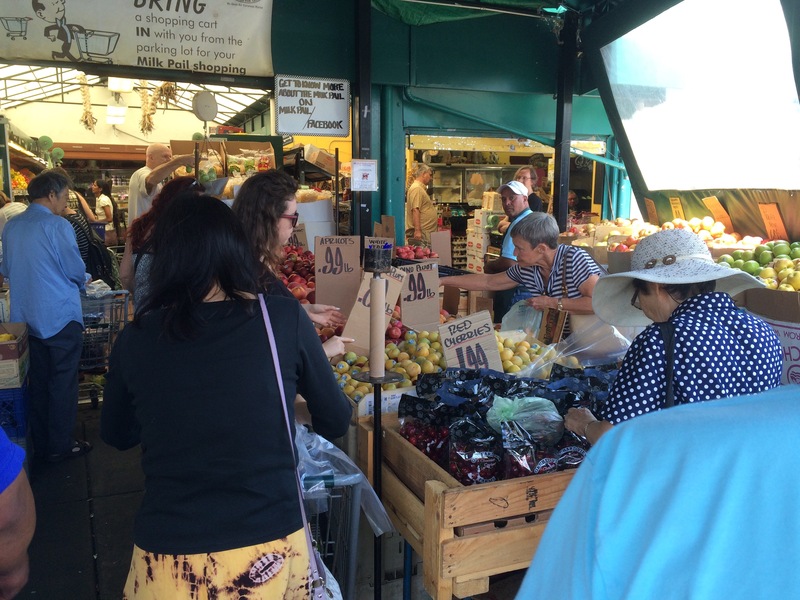 The prices are often a really good indicator of what fruits and veggies are in season. They also have a huge selection of cheeses and various discounted imports. 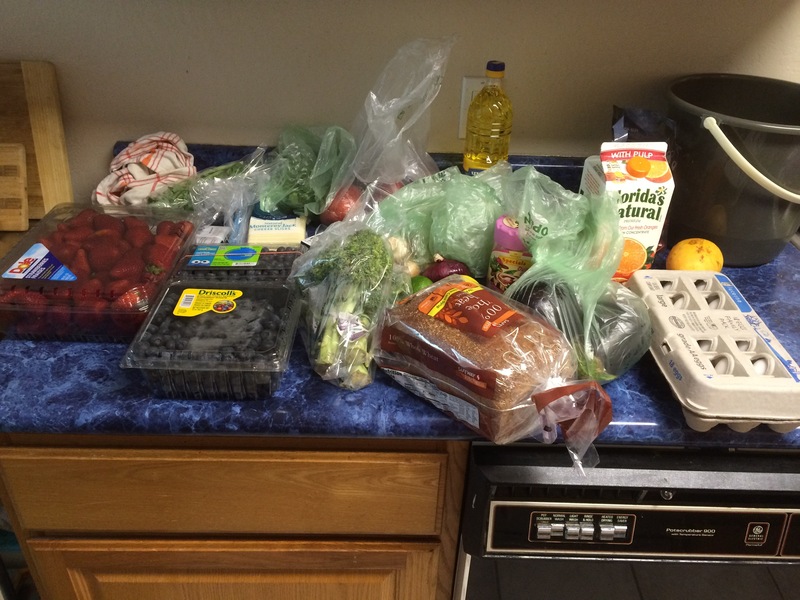 This week, I got 4 pounds of strawberries for $5 and 3 heads of broccoli for $.39. After that, Julie and I head over to Safeway to get everything else. We like Trader Joe’s and Sprout, but they don’t always have everything. 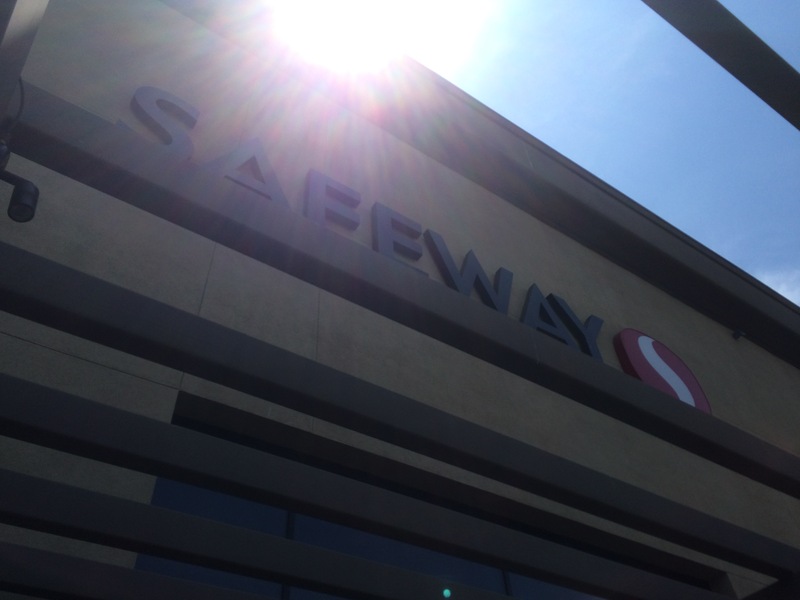 Since we already covered our cheap produce at the Milk Pail, Safeway is our only other stop because we know we can find everything at Safeway. After that, we head home and stash all of our haul. California summers bring delicious berries and stone fruits season. 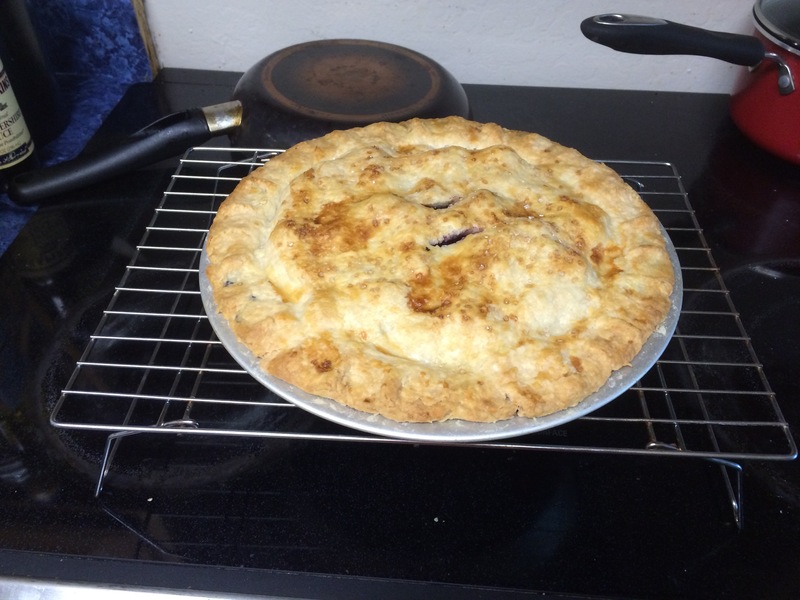 We got 2 pounds of blueberries for $5, so when we got home, we made a blueberry pie. Julie inherited a recipe and gift for making pies from her mom, so I help around the sides while she is working on the pastry. We have made many pies over the past few years, so we have a process down. Pies are “medium” difficulty amongst baked goods. Getting the pastry right takes time, and it is easy to overmix. That’s why I let Julie do it. This particular pie turned out really well. The blueberries were very sweet, and the pastry was flaky and didn’t get soggy. Julie can also do the lattice, but we just went for the 2 holes on this one. If you haven’t heard of Yotam Ottolenghi and Plenty, then you have a more healthy relationship with food blogs and podcasts than I do. Ottolenghi’s cookbooks have been very popular as he cooks with a Middle Eastern style but also mixes with other ethnic cuisines. 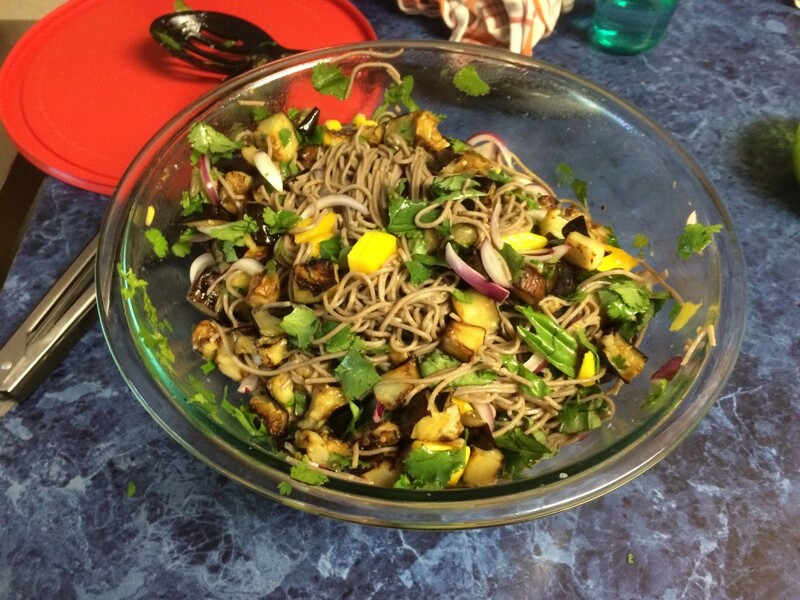 Plenty has all vegetarian recipes, and the “Soba noodles with eggplant and mango” that we decided to make on Sunday is definitely Asian inspired. Like with Plated or Blue Apron, I usually do most of the prep work. The onions and eggplant were relatively straightforward to do, but plucking and chopping the herbs was more time-consuming. 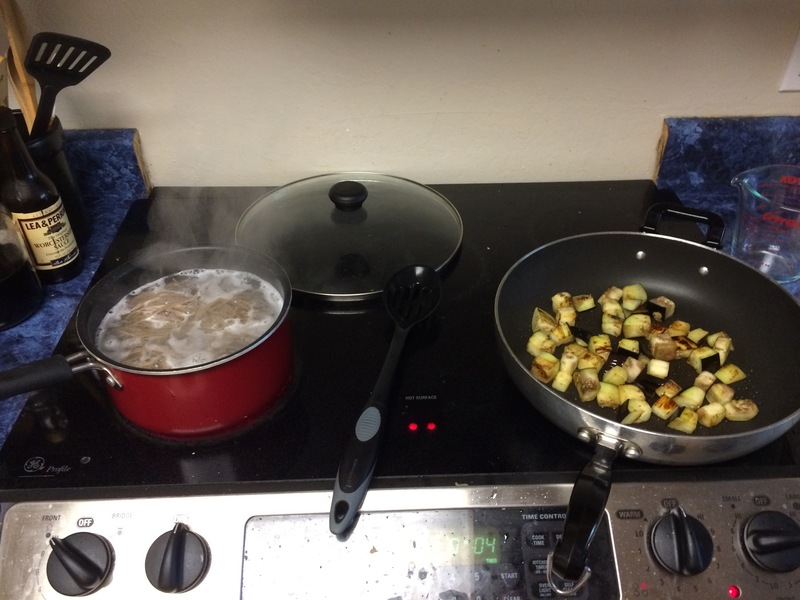 The recipe called for the eggplants to be shallow-fried, and eggplants sucked the oil right up. Usually the 1 cup of oil stays in the pan, but this time, all of it ended up in the serving bowl. Yikes. After that, all of the ingredients just get mixed together into a bowl with the sauce to sit for an hour or two. Presumably, this step is to let the flavors meld together. It looks better in the cookbook pictures. As usual. Julie and I both loved the dish. The mango against a mostly vinegar-based sauce and the eggplants and the bitterness of the herbs worked really well. It did take a few hours to make, but we usually plan our most ambitious cooking for Sunday anyways. I get breakfast for the office on Monday mornings, and when I am motivated, I bake for them. Cheap strawberries get used in baking and morning oatmeal. I also had previously frozen heavy cream and defrosted it with the intent to whip it up for the long-cake. However, heavy cream separates when frozen, and no amount of shaking was going to re-emulsify it. 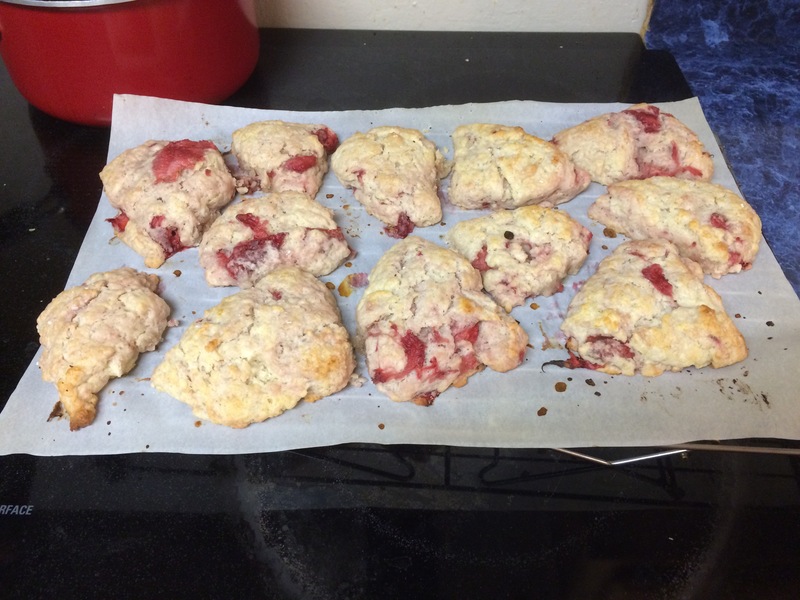 It still works for baking though, so I made these strawberries and cream scones. I underbaked them, so they were more gooey and less fluffy than I was hoping. I was worried about them coming out dry, but with so much heavy cream and butter in it, that seems silly now. Last year for my birthday, I was going to get myself a baking steel. 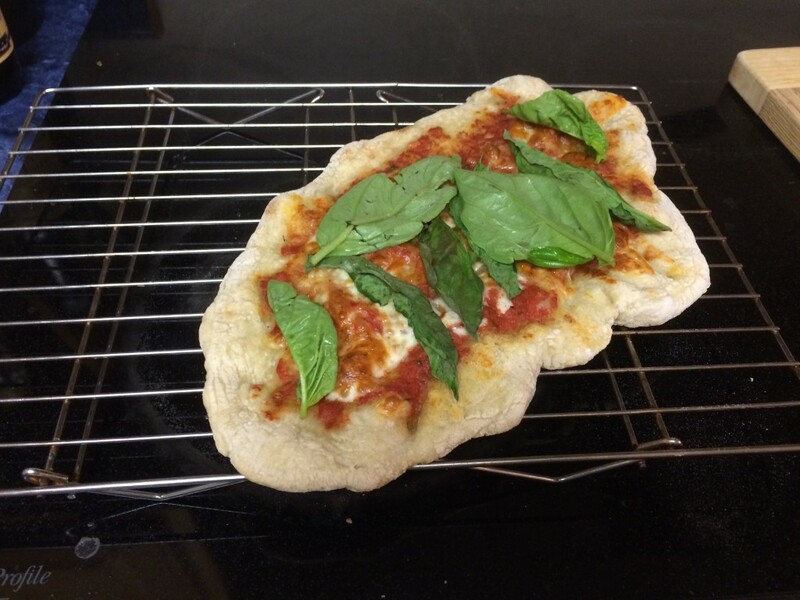 I’m a believer that great pizza starts with great crust. Great crust comes from delivering a lot of heat. And quarter-inch thick piece of steel can deliver a lot of heat. I was waiting around for the baking steel with the inset rim, but when it was finally released, I found out that it doesn’t really work with my glass stovetop. That was a shame, but at least I finally ordered my baking steel last month, and we made margherita pizzas for dinner on Monday night. 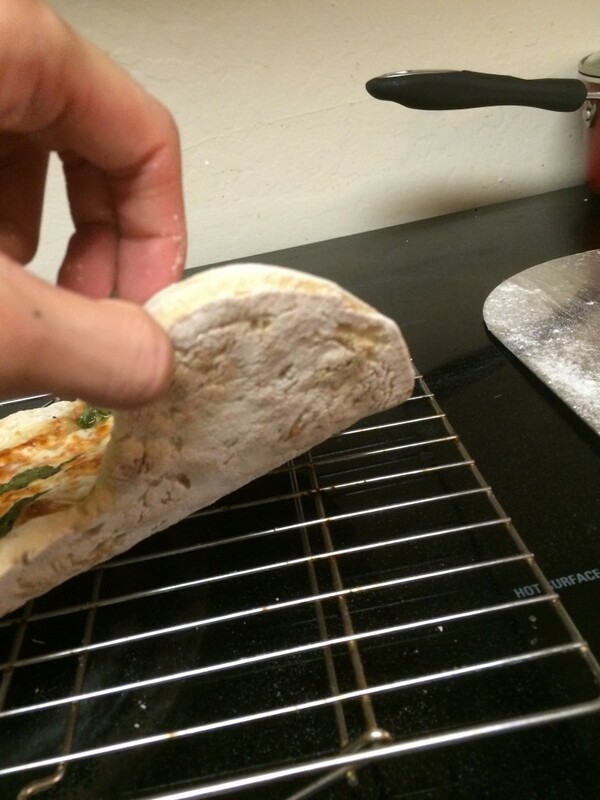 Pizza is unusual because the longest part is preheating the pizza steel/stone for an hour. The baking itself only takes 7 minutes. Unfortunately, pizzas are best extremely fresh, so I am usually shuffling back and forth between eating and making the next pizza. Next time, I will use fresh ingredients. I’m mostly just proud that I got all of the pizzas in and out of the oven in one piece. Previous attempts to use the pizza peel ended with the end of the pizza flopping over toppings down onto the pan. I would like to thank YouTube for not screwing it up this time. 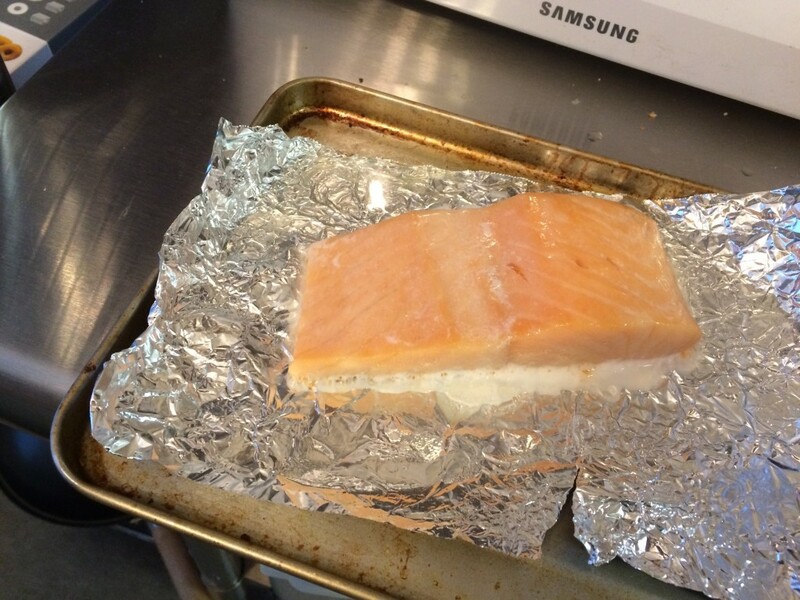 On Wednesday night, we made “Toaster Oven Salmon” out of the Modernist Cuisine at Home. The recipe is actually quite simple: brine the salmon (we used defrosted frozen Atlantic salmon from Costco) in salt and sugar, then bake it for about 40 minutes at 225F in the toaster oven. 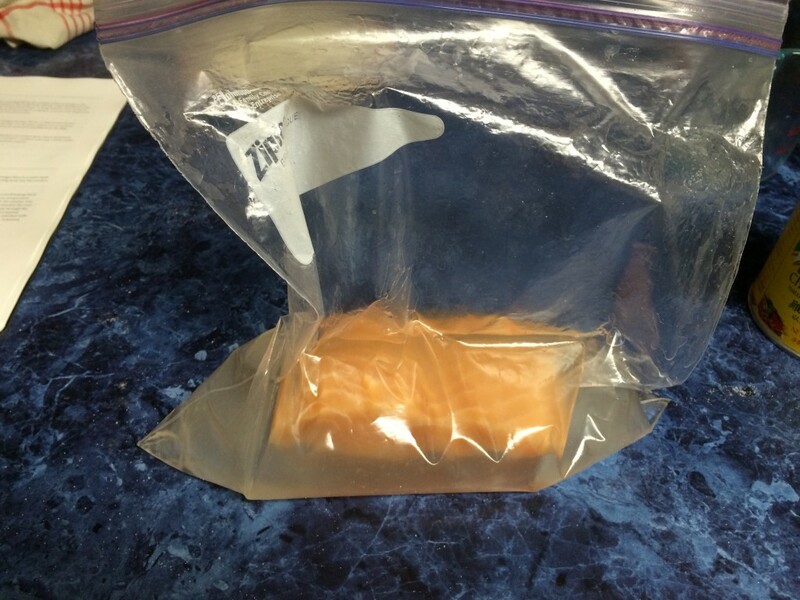 It is intended to emulate the effect of sous vide cooking with a longer, low heat cook. I put it in the brine in the morning and started it in the toaster oven as soon as I got home, so it was also very quick. The salmon was great. Julie and I often do a Chinese-style salmon cooked in the toaster oven in foil with soy sauce, oil, ginger, and garlic, but this salmon was very different. It was perfectly, barely cooked and still retained the pure salmon flavor. We had it over rice with steamed broccoli and carrots. This week of cooking was unusually exciting for us: we usually don’t bake more than once a week, and the Plenty recipe is more ambitious than usual. In a typical week, we typically would have cooked at least one Chinese dish (like a stir-fry) that looks more like home cooking than most of these dishes. That, however, is the hallmark of home cooking. Sometimes we’re more or less ambitious with what we make, and the meals end up being less square than any other setup. As a matter of getting enjoyable sustenance, it isn’t necessarily efficient. Because cooking is a hobby and quality time for Julie and me, the variability allows us to make it exactly as valuable as what we put into it. 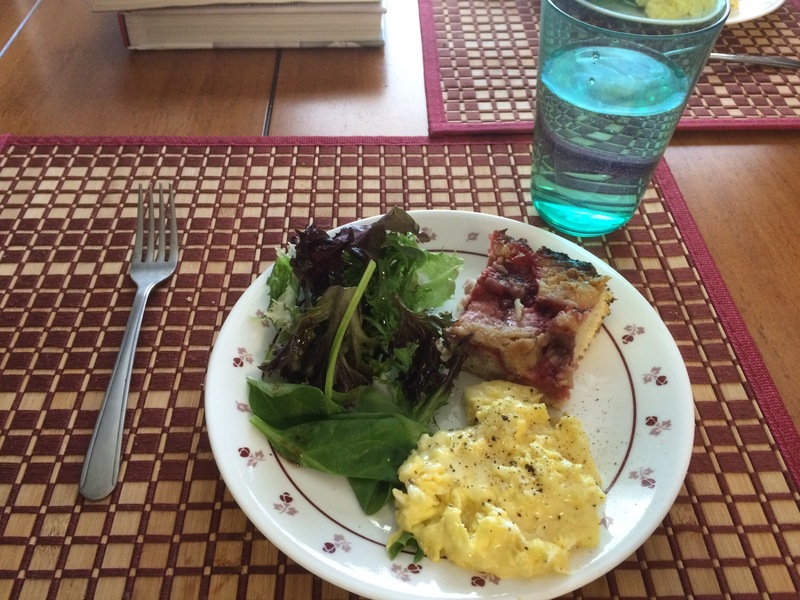 This post is part of the Dinner Table Tournament where I pull Julie along my need for novel experiences in “staying in” dinner options to generate blog content. I have not been compensated by Blue Apron for this in any way for this post. Yet.